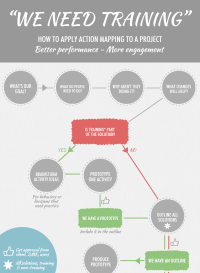 Action mapping process: This interactive graphic describes the entire action mapping process from goal-setting to development and evaluation. You can download a PNG version of the graphic from the same page. 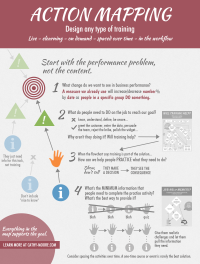 Process as a Word doc: Edit this Word doc to apply it to your team and projects. Download it from the interactive graphic. Will training help? 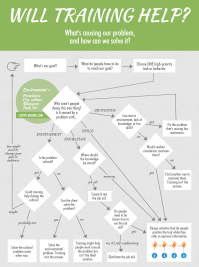 Use this flowchart with your SME and, ideally, your client to answer the question, “Why aren’t people doing this thing?” or “What makes it difficult?” You’ll decide how much of the problem is due to the environment, lack of knowledge, or lack of skills. Watch a short video to see how the chart works. Job aid or memory? It’s common for a subject matter expert to think people need to memorize information when it would be easier (and often more reliable) to look it up instead. 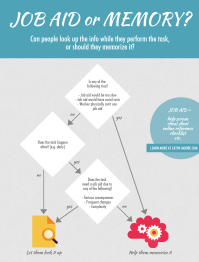 This flowchart will help you identify when people really need to memorize information. Checklist for strong learning design: Use this intentionally controversial checklist to spur discussion when you’re evaluating training material. 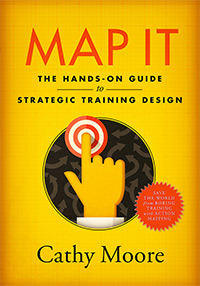 It helps you decide whether the material is action-oriented or an information dump.